The Amateur Planner: What's wrong with this picture? A simple question: What is wrong with this picture? The answer: the cars have a green light to go straight, but the pedestrians have to wait. This signal is optimized for vehicle movement, at the expense of the safety and convenience of pedestrians. Considering that this is an area with high pedestrian use—at the northern end of the BU Bridge along the Paul Dudley White bike path—it is nonsensical that such priority is given to vehicles rather than pedestrians. The only way to get a "walk" light is to push the "beg button" on either side of the crosswalk—otherwise the light stays at "don't walk" encouraging drivers to make the turn without looking for pedestrians. But it's worse. Look to the right. There's a second traffic light showing green. Cars driving a downgrade are encouraged to make the turn as fast as possible (the tapered corner doesn't help), at the expense of the pedestrians. Want to cross? Wait until a red light. Although it's not like that will even help that much: cars can still take a right on red (after "stopping"). What could be changed to make this intersection safer? The once-you've-turned light should be removed or relocated. Right now it is too far around the curve. By the time a driver sees it in its green phase, they are already crossing the crosswalk. In its red phase, a driver who had missed the main signal would have already crossed the crosswalk. It could be replaced with a "yield to pedestrians in crosswalk" sign. The walk signal should be changed to display a "walk" sign with every green phase of the light. This will allow for safer pedestrian movement and will not relegate pedestrians to play second fiddle to automobiles at this intersection. It could be enhanced with conspicuous "yield to pedestrians in crosswalk" signage. At slightly more cost (the first two items would simply require reprogramming or removing the lights) the curb should be bumped out to create more of a right turn movement. This will require vehicles to slow down as they make the turn to cross the crosswalk, which will allow them to better look for pedestrians crossing from one side of the roadway to the other. This is traffic calming at its simplest: traffic throughput will not likely be curtailed (the bottlenecks in this intersection are not due to this light, but are at other locations) and it would significantly enhance conditions for more vulnerable road users. 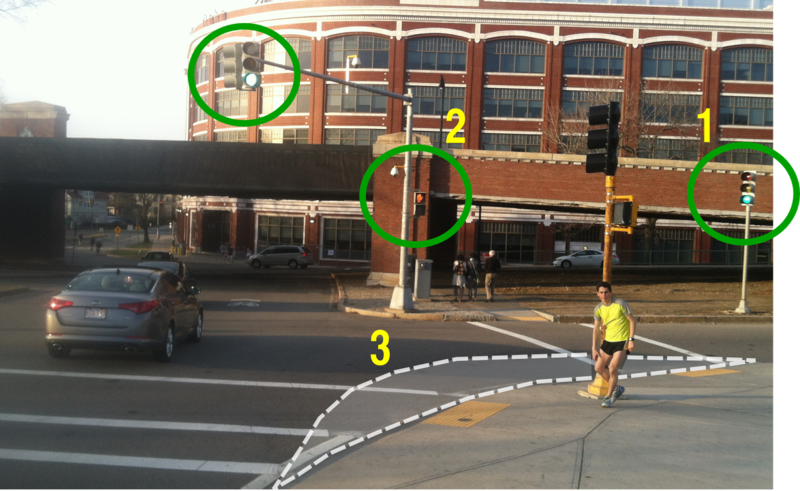 Have you ever seen a DCR-owned intersection that ISN'T all about moving cars? There is a Cambridge side portion to Comm ave phase 2b that deals with this, the Reid overpass, and it might be useful to lobby Cambridge's transportation dept for a better design. Traffic Light #1 looks like a remnant from a possible past right turn slip lane there. I'm too lazy to look for historical imagery, but the sidewalk looks like it was extended at some point. Your #3 extension would help. I think generally narrowing the lanes through there would help. As both a cyclist and pedestrian, that ramp in the background is also kind of scary as it's got nothing but a yield sign and cars coming off Memorial Drive can be going pretty fast. Either a flashing red light, or a raised crosswalk might be in order there. Good catch, anon! 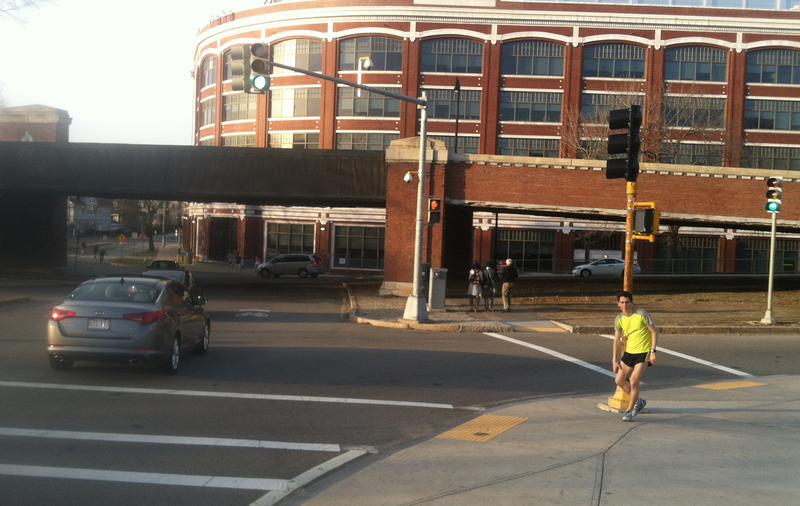 Before the BU Bridge was rebuilt, there was a right turn slip lane there and a pedestrian island. When they rebuilt it, they should have built it with pedestrians in mind more than vehicles. Getting rid of that slip lane and bumping out the sidewalk was a very good improvement. Before, there wasn't much space to wait to cross, and cars would come around the corner very quickly. But clearly they didn't adjust the signal timing in a pedestrian-friendly way. Additionally, you can probably create a pretty tight corner there. The only thing larger than a car that has to turn right there is the CT2 bus. No trucks on to Memorial Drive. As long as it can make the right, you're good to go. I also suspect that signal patterns like this make pedestrians more likely to ignore the signals, leading to situations in which they are likely to wander into the street both when they should have a walk light and when they should be firmly planted on the curb waiting for cross traffic.